Using observations from the Cassini spacecraft, a team of astronomers from Observatoire de Paris and Observatoire de la Côte d’Azur have been able to specify the possible positions of a ninth planet in the solar system. This work is the subject of a publication in Astronomy & Astrophysics letters on February 22, 2016. The Kuiper Belt Objects, small bodies similar to Pluto beyond Neptune, have a particular distribution that is difficult to explain by pure chance. This is what led Konstantin Batygin and Mike Brown (Caltech / USA) to propose, in a paper published January 20, 2016 in Astronomical Journal, the existence of a ninth planet of 10 Earth masses whose perturbations on Kuiper Objects could have led to their current distribution. By numerical simulations, they determined the possible orbit of this planet. To be able to reproduce the observed distribution of Kuiper Belt Objects, this orbit, with a semi-major axis of 700 AU, must be very eccentric (e = 0.6) (see Figure 2) and inclined (i = 30), but no constraints on the current position of the planet is proposed in the study of Batygin and Brown. This does not facilitate the task of the observers who need to search in all possible directions in longitude to try to discover this planet. Since 2003, A. Fienga (astronomer at the Observatoire de la Côte d’Azur), J. Laskar (astronomer at the Paris Observatory, research director at CNRS), and their team, are developing the INPOP planetary ephemerides, which calculate the motion of planets in the solar system with the highest accuracy. In particular, using data from the Cassini spacecraft (NASA / ESA / ASI), the distance between The Earth and Saturn is known with an uncertainty of about 100m. The researchers had the idea to use the INPOP model to test the possibility of adding a ninth planet in the solar system, as proposed by Batygin and Brown. Fig 1. - Analysis of the radio data from the Cassini spacecraft that provide a very accurate measurement of the distance from Earth to Saturn, with a 75m residue. If we add the ninth planet in the model, the differences between calculation and observation seriously deteriorate (in blue). After adjustment of all parameters of the solar system, these differences are greatly reduced (in red). 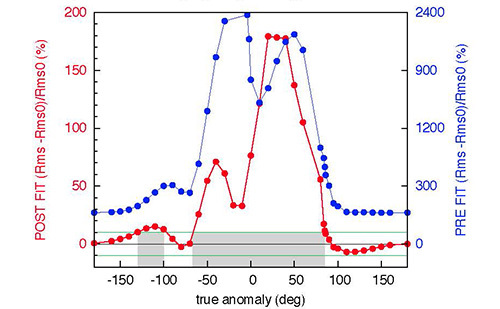 Excess residues of more than 10% after adjustment is the evidence of the non existence of the planet (gray area) (see Fig.2). In the study published this week, the French team shows that depending on the position of the planet from its perihelion, the ninth planet induces perturbations in the orbit of Saturn that can be detected by analyzing the radio data from the Cassini spacecraft, orbiting Saturn since 2004. The researchers were able to compute the effect induced by the ninth planet and to compare the perturbed orbit to the Cassini data. For angle from perihelia of less than 85 ° or greater than -65 °, the perturbations induced by the ninth planet are inconsistent with the observed Cassini distances. The result is the same for the sector from -130 ° to -100 ° (Fig.1). This result allows to exclude half of the directions in longitude, in which the planet can not be found (Fig.2). On the other hand, it appears that for some directions, the addition of the ninth planet reduces the discrepancies between the model calculated by the astronomers and the observed data, by comparison to a model that does not include this ninth planet. This makes plausible the presence thereof of the ninth planet for angle from perihelia between 108 ° and 129 °, with a maximum probability for 117 ° (Fig. 2). Fig.2. Location of a possible ninth planet. Analysis of radio data from the Cassini spacecraft defines forbidden areas (in red) where the perturbations created by the planet are inconsistent with observations, and a likely area (green) where the addition of the planet improves the model prediction, reducing the differences between the calculations and Cassini data. The position of minimum residues is the most likely location for a planet at P9. Scales are in astronomical units (AU). The existence of a ninth planet can only be confirmed by direct observation, but by restricting the possible directions of research, the French team makes here an important contribution in this quest.